Horribly behind here as usual: This snail adventure was almost two months ago, in the Piedmonte region of Italy. 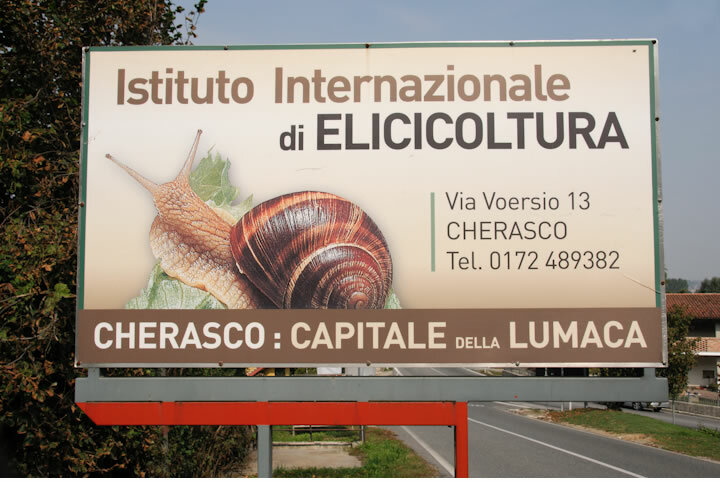 Steve and I have long had a fondness for escargots – recognizing them, of course, for what they really are: first-class carriers for butter and garlic – which is why I had put the small town of Cherasco on our must-visit list. It bills itself as Italy’s capital of lumache…snails – its restaurants specialize in snail dishes, it hosts an annual snail festival, and it’s home to the International Institute of Heliculture, a.k.a. snail farming. 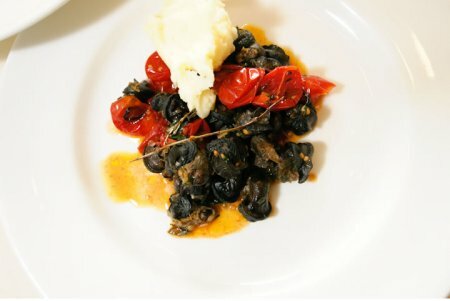 The first time we ate in Cherasco (at an osteria called La Rosa Rossa), the snails on our plates were easily twice the size of the French escargots we were accustomed to, and they were served without their shells, as is the custom in the area. Mine were in a tomato-based red sauce; Steve’s, in an herb-based green sauce. But the snails weren’t mere carriers for the sauce – they had real flavour. Both dishes were fabulous, as was the rest of the meal. (The agnolotti al plin, in a simple butter and sage sauce, were perhaps the finest pasta I had ever tasted.) As we ate, I told Steve what I had read about the local snail farms. “They consist of gardens of gorgeous greens for the snails to eat,” I said. “That’s why they’re so fat and delicious.” An ill-advised conversational gambit. “And you haven’t arranged for us to visit one?” he responded. 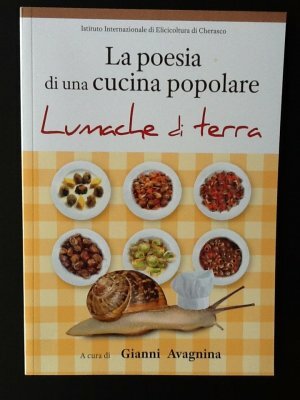 Which is why we found ourselves two days later in the hands of the exuberant and multilingual Simone Sampò, at a demonstration snail farm on the outskirts of Cherasco: 8000 metres of salad with a couple stands of tall sunflowers thrown in. 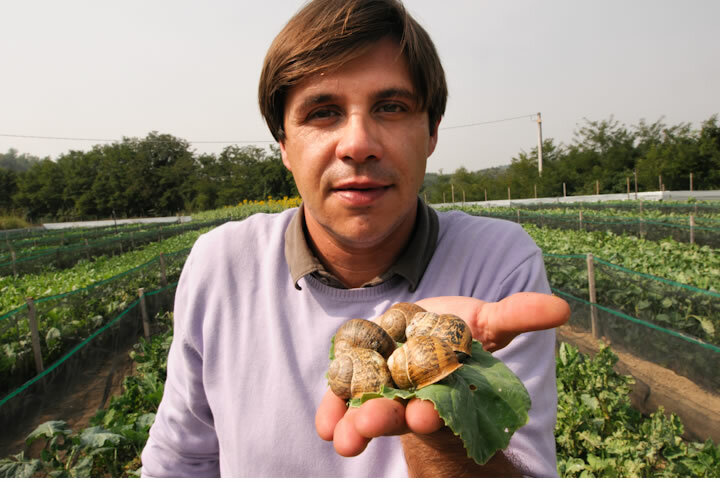 Fields of greens: Simone Sampò at the snail farm, with some of his "product"
Gardeners usually hate them, but in Cherasco, Helix snails can feast without fear. At least until harvest time. Move over, Iron Chef: Make room for SnailChef. The institute has a raft of promotional and educational materials to sell both the farming method and the full-grown product. 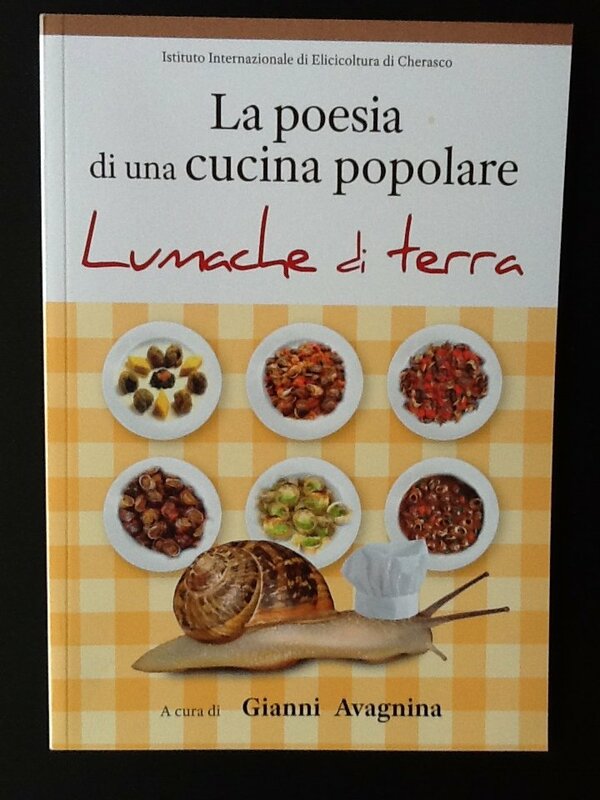 The covers of the books and brochures, however, are a curious photographic stew, showing live snails juxtaposed (thanks to Photoshop) with prepared snail dishes, their worm-like bodies fully extended from their shells. In one case, a crawling snail even wears a chef’s toque, just behind its feelers. Bad idea, boys. Kind of takes the edge off dinner. But Simone made snail farming sound like such an easy route to success, he almost had Steve convinced to give it a try (except that Canadian winters would be a serious detriment to the crop). 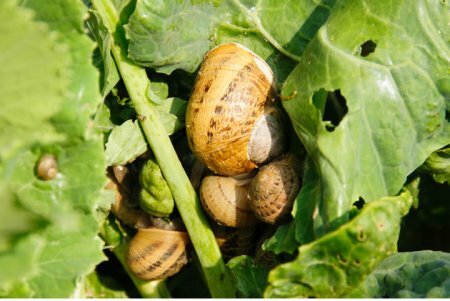 For starters, you don’t have to worry about your livestock escaping on you, even at a snail’s pace. Between the garden beds are dirt paths: No self-respecting snail is going to choose dirt over luscious greens. If they climb out of the netting that encloses one bed, they’ll climb back over the netting into the next one. Nessun problema. Still, a corrugated metal fence with a locked gate surrounds the entire farm: “Otherwise, people will come in the night to take the snails,” Simone explained. Before leaving, we tell him we’re heading to La Torre, another Cherasco osteria, for lunch. Simone brings his fingers to his lips and kisses them. “Squisito,” he says. You’ll never guess what I order.